A US destroyer fired cruise missiles on Houthi rebels early Thursday morning, attacking radar installations that the US claims were used by the rebels to target the USS Mason, another destroyer. The missile launches from the USS Nitze mark the first time the US had directly attacked the Houthis in Yemen. The US strike followed a second missile fired from rebel-held territory in Yemen targeting a US destroyer, a US defence official said on Wednesday. However, Houthi rebels issued a statement denying they had fired a missile at the US vessel. “Those claims are baseless,” the rebel-controlled Saba news agency quoted a military official as saying. Wednesday’s attack involved a “coastal defence cruise missile” fired from a Houthi-controlled area south of al-Hudaida, the US official said. The USS Mason used countermeasures after detecting the missile at about 6pm local time on Wednesday. “It is unclear if the countermeasures caused the missile to hit the water, or if it would have hit the water on its own,” said the official. The ship was not hit. On Sunday, two missiles fired from rebel-held territory in Yemen fell short of the Mason as it patrolled the Red Sea off the coast of the war-torn country. 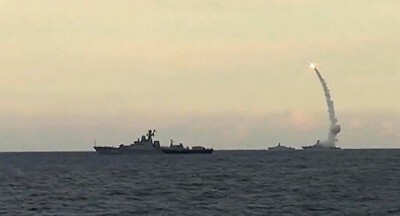 Both missiles hit the water before reaching the ship and no one was injured in that incident, officials said. On Monday, the Saudi-led coalition accused the rebels of firing a ballistic missile towards the southwestern Saudi city of Taif, hundreds of kilometres from the Yemeni border. The missile was one of two that the coalition intercepted on Sunday – the other was launched toward Marib, east of Yemen’s rebel-held capital Sanaa. The incidents come after the United Arab Emirates said last Wednesday that Yemeni rebels struck a “civilian” vessel in the strategic Bab al-Mandab waterway, wounding crewmen. Rebels claimed the attack, which was carried out on 1 October. The UAE is a key member of a Saudi-led coalition that has been pounding Yemen since March of last year. Also, Houthi rebels fired a missile at the main Saudi air base used by the Arab coalition in its bombing campaign but it was intercepted, the coalition said on Wednesday. It was the second such missile launch since a coalition air strike killed more than 140 people attending a wake in Sanaa on Saturday, prompting threats of revenge. Air defence forces “intercepted a ballistic missile, launched by the Houthi militias toward the city of Khamis Mushait and destroyed it without any damage,” a coalition statement said. Khamis Mushait is home to the air base that has been at the forefront of the coalition bombing campaign against Houthi rebels and their allies. It is about 100km from the Yemeni border.